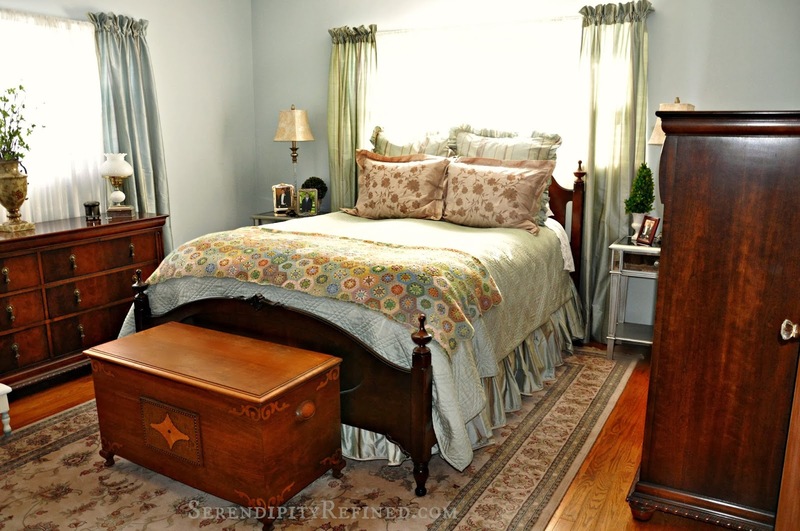 A few of you have asked me for "after" photos of the master bedroom. These photos aren't great but they'll give you an idea of where things are. You may recall the photo below from August when I shared it as I stripped the floor to ceiling wallpaper that covered every wall. Remember the leak in the corner of the room and the ceiling that took three coats of white paint before it was clean? This room isn't perfect, but it's much better. It still has wayyy too much furniture but that'll change soon enough. How about this view of the wall where I found hundreds of pieces of tape behind the wallpaper? Remember that? To tell you the truth, I had blocked the traumatic images forgotten how this room looked. The reason that I haven't shown you any "after" photos before now is that they really aren't after....they're more like during photos. 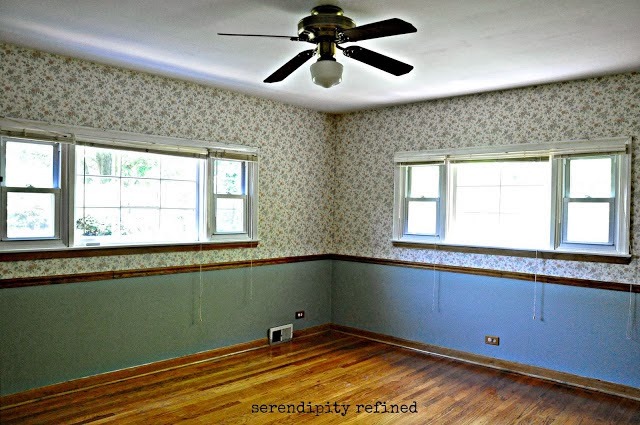 Yes, I stripped the wallpaper, removed the chair rail, painted the ceiling, walls and trim. 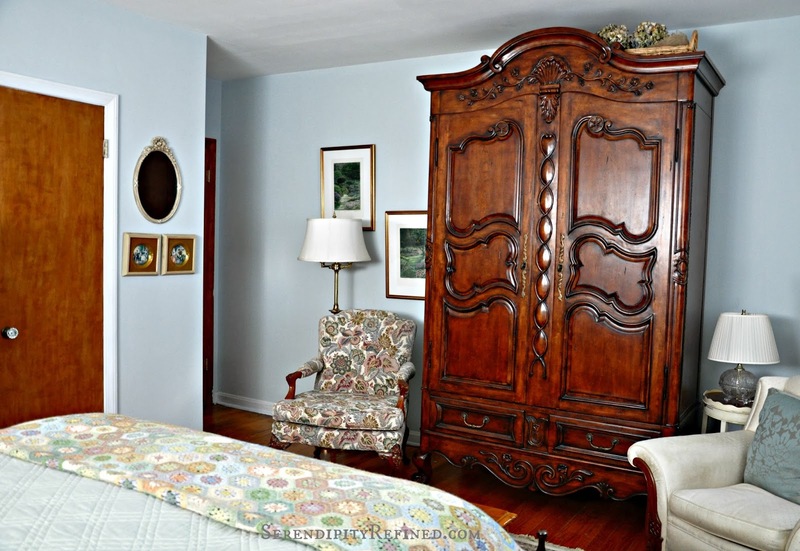 The closets were also outfitted with 1950's style wood closet rods and shelves. The broken plastic blinds were removed and $5 metal curtain rods were installed to accommodate hanging the sheers and window panels from the master bedroom at our last home. 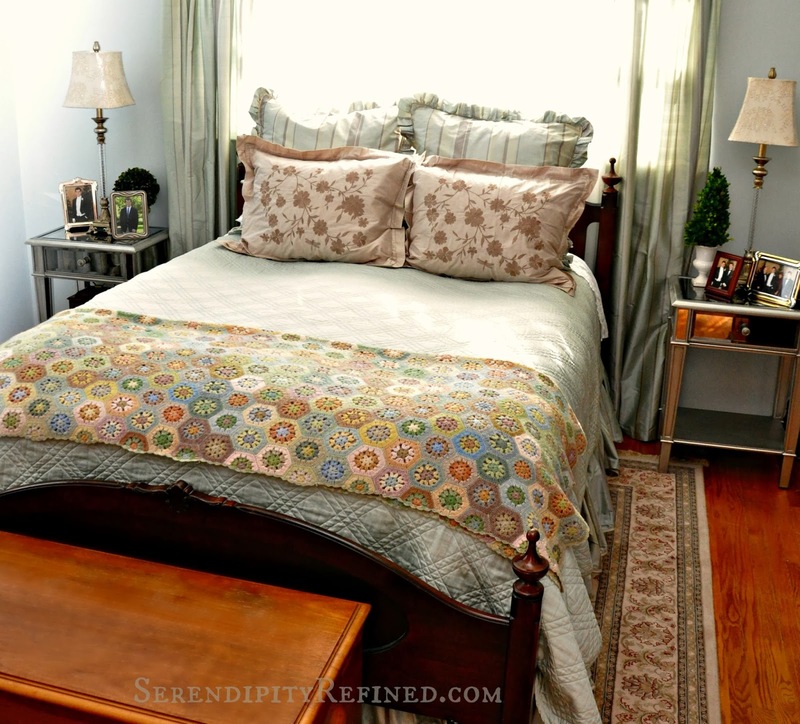 The total cost of making this room temporarily inhabitable was under $100. 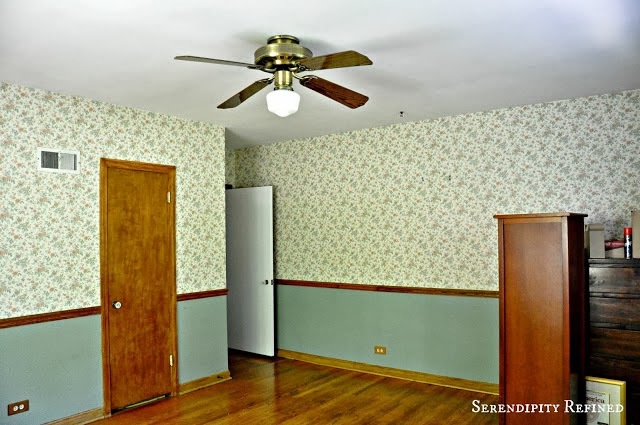 The reason for this "low budget makeover" is that something needed to be done with the nicotine soaked wallpaper and ceiling before I could sleep in this room but, in a few short months, this room will cease to exist. It will become the connecting space for the "stable wing" of the house. Most of the room will eventually become part of our new kitchen and, at least as the drawings are today, the window behind the bed will become the window above my kitchen sink (unless I change it within the next week before we go to final drawings). I can not believe that we may actually get to start on phase 2 in just a couple short months. Of course, I also can't believe that it's been almost six months since we decided to do this project. 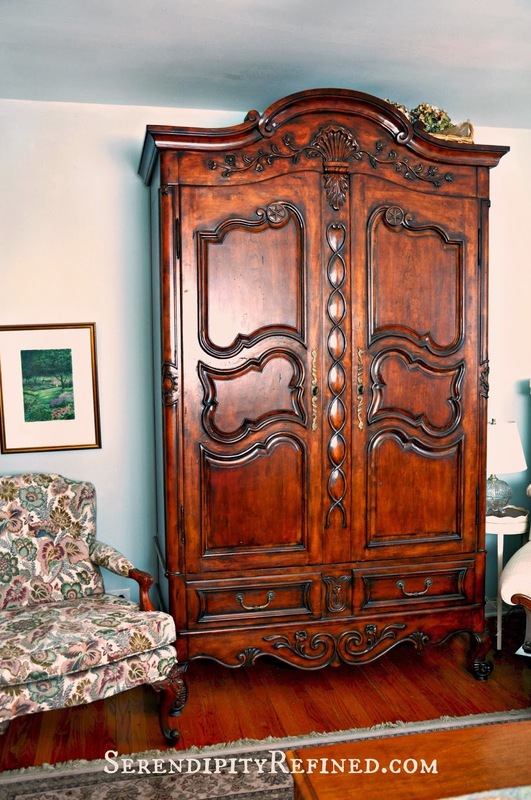 Speaking of things that are hard to believe, how about the fact that this giant cabinet actually fit through the doorway in the house. I wish that there had been video of it being lowered, on straps, down the open staircase at our last house...in pieces. Let me just say, there was no way that I was leaving it...at least we didn't have to take out a window! I spent January and February learning our village's building codes and setback ordinances and meeting with some really helpful people on the planning commission and the zoning board. I've spent time talking to builders (six in total), hiring a civil engineering firm that will provide the topographical survey to ensure that we don't disturb the water flow in the area or create any drainage issues for the homes "down the hill" from us. I've also been tweaking the final floor plan for phase 2 and have begun to gather "parts" for the new house like the 60 inch farmhouse sink that I found on Craigslist and which came home last night! I'd show you photos, but it's still in the truck until we build a ramp to unload it...that's tonight's adventure. 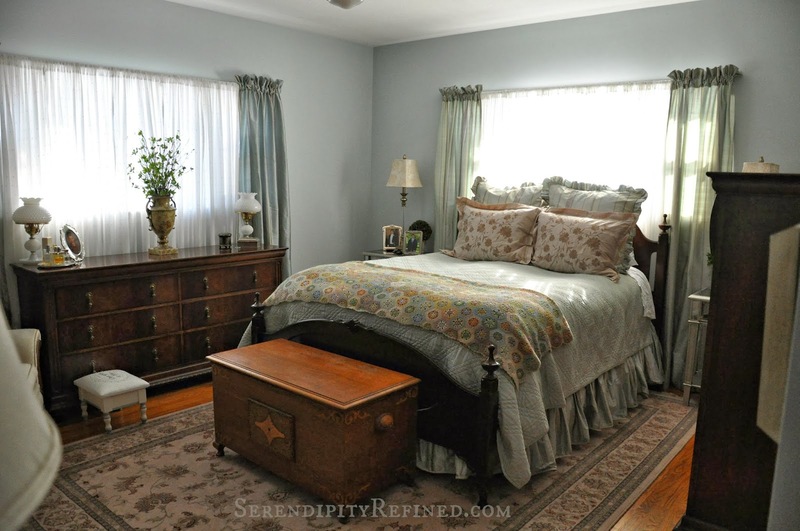 Wall color: Benjamin Moore Aura color matched to Farrow and Ball "Borrowed Light"